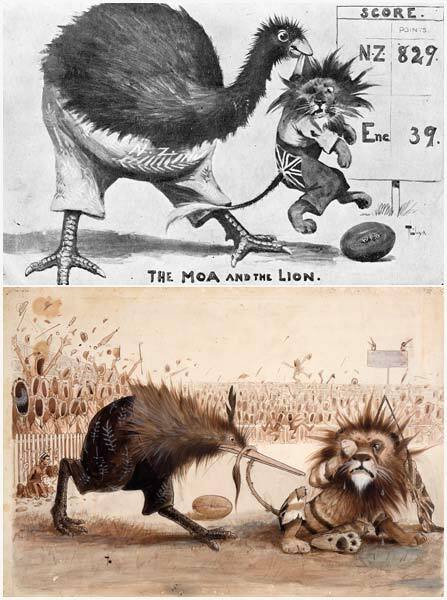 When Trevor Lloyd drew the top image, for a postcard about the 1905 All Blacks tour of the United Kingdom, he represented New Zealand as a moa, which had been the country's dominant bird symbol in the 19th century. But three years later his cartoon commenting on the All Blacks victory over an Anglo-Welsh team in Auckland on 25 July 1908 (bottom) featured a triumphant kiwi. It appears that the very first cartoon featuring a kiwi was in August 1904. By the time of the First World War the kiwi had become the dominant bird symbol of the nation and New Zealanders themselves came to be known as 'Kiwis'. Reference: Eph-A-RUGBY-1905-1 (top); C-109-020 (bottom).